The crew of the USS Enterprise meets an unstoppable force of terror from within Starfleet, Captain Kirk leads a manhunt to capture a one man weapon of mass destruction. The central relationship between Kirk and Spock is the most compelling element out of the entire Star Trek canon. My peers frequently debate me about Star Trek: The Next Generation but my viewing experience of TNG has only been the movies. Unfortunately I missed it as a television series. For my money, there’s been nothing nearly as compelling and iconic as Kirk’s hot-blooded brash instinct versus Spock’s cold logic and the temperamental humane Dr. McCoy caught between them. I love what they each represent and their eternal triangular quarrel. They want to work together to solve grandiose problems but they all see different on the approach. Never does one of them ever solve the solution completely with their own philosophy and often it’s a varying combination of all three that saves the day. It’s about hearing people out, being unassuming and adapting to new ideas. When Star Trek: The Original Series debuted in the mid-60’s, Gene Roddenberry intended the original show to have a major political agenda and aimed to present an optimistic version of what man can be at their very best. 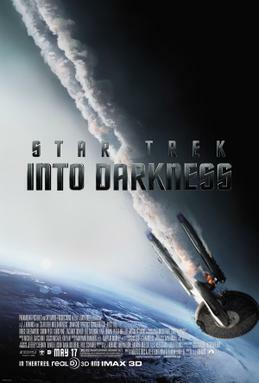 Much of the essence from Star Trek: The Original Series remains in Star Trek Into Darkness, it contains themes about colonialism, political intervention, foreign policy and terrorism. But it is there only if you want to read it. These themes are expressed in a muted fashion as the thematic discussions are always running parallel to major action set pieces. As if the material was like a shark that had to keep moving at breakneck speed or it will risk dying of boredom. Personally, I never minded those thematic discussions in the previous Star Trek films. A few more quiet moments wouldn’t have been bad either. Just saying. Now that J.J. Abrams is helming the next Star Wars movie, the “Star Wars vs. Star Trek” geek war that existed when I was a teenager might very well be over now. A Star Wars influence is present in the film and I ponder what elements Abrams will bring over. The script is workshopped to an inch of its life. Heck, it’s indicative in the film’s “no colon” title. The fact that the writers have been quoted stating that “There’s no word that comes after the colon after Star Trek that’s cool.” has been clearly spent way too much time pulling their hair psychotically, obsessing over every detail and perfecting the story over coffee-spilled paper. Seriously, is there really a group of people out there that feels negative about colons after the movie title? Does that really justify warping (yes, pun intended) English grammar? This sounds like ranting but I really mean this as a compliment to their supposed geek madness. The cast delivers as they did in the previous installment. I do think having watched the previous installment helps immensely as there are not a lot of character building moments for everybody. But the actors are all well casted in their roles and fortunately every crew member still has something to do. Zachary Quinto shines as Spock and his friendship with Chris Pine’s Kirk is a believable one. Their friendship is the heart of the movie. Simon Pegg gets to do something new as Scotty. Benedict Cumberbatch is a great villain. He owns the audience. One minute he is savagely evil, the next minute we slightly sympathize with him and then he shifts again. On that note, I can’t wait for Sherlock season 3. This is a very ambitious film that has a lot of things to accomplish. It’s trying to deliver a story with multiple characters, please both the non-fans and the fans, go to new territory but also honor the spirit of the original series. The film essentially wants to have its cake and eat it too but it accomplishes it really well. If J.J. Abrams’ gave any more pop culture nods as he does in this film, his head would fall off. I cheered at the spectacle of the action scenes, laughed at the in-jokes, and almost cried at the film’s climax. It doesn’t go to new territory as much as the first one and I hope they do go somewhere new for the next installment. 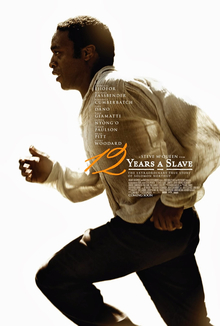 I want to see it again and look forward to the third installment. Hopefully it won’t take as long as this one.